Wearing mighty armour and a shield that have been passed on through generations of Dwarves, the Dwarvish Protectors withstand even the most vicious weapons and hottest flames. The Protectors are a rare caste of Dwarves that have sworn allegiance to the lord of the clan to which they belong and will die to protect him. 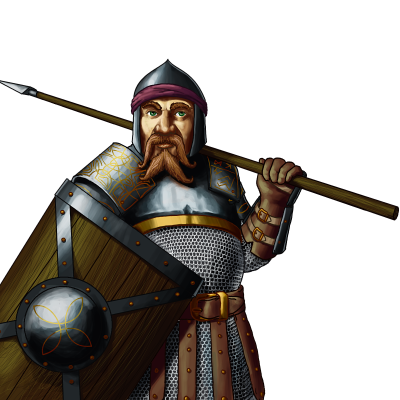 As such, the Protectors are often seen in the throne-halls of the imposing fortifications of the Dwarves. Standing still for days on end and blessed with a stoic mind, they are often nearly mistaken for the lifeless statues of stone that grace the inner halls made in the likeness of the greatest warriors of yore. In times of war, Protectors stand side by side with their clanmates and lords, their mighty shields protecting not only themselves but also the warriors at their sides. Being able to call forth lightning strikes with their voice alone, the enemy army often scatters before a battle even takes place.